One of the great things about Walk London is the connections their tours make between entirely random things that demonstrate the evolution of London in the last few centuries. Now running for many years, a tour I have long wanted to try out is the riverside stroll from City Hall to Canary Wharf, a two and a half hour industrial voyage beyond the edges of Zone 1 that links Captain Kidd and Ian McKellen with painters Turner and Whistler. Only the eclectic and fascinating Walk London tours could tell one coherent story that takes in hundreds of years of history and covers topics as diverse as the rise of fall of neighbourhoods in East London, secret underground waterways, historic pubs and West End theatre safety curtains. Usually when you think of East London it’s probably all Hackney hipsters and Kray family violence, but the area from Tower Hill, through Shadwell and Wapping to Limehouse is a beautiful part of the city and one I was completely unfamiliar with. On the clipper to Greenwich, you see wharfs, now converted into luxury flats and hotels, which were once the site of one of the busiest docks in the world, but Walk London takes you through the beautiful backstreets where former warehouses sit next to charming Georgian Squares that could almost have come from Bloomsbury. We learn that these were formerly home to naval officers and their families in what was once a fashionable and prosperous area, close to the bustling industry of the river – which for a weekend and heavily residential area was strangely deserted and entirely lacking in tourists. The river of course runs right through this story and is the heart of the tour as you make you way along the Thames Path towards the shiny fronted skyscrapers of Canary Wharf, as tour guide Peter expertly points out the various docks and buildings that kept the British Empire afloat. St Katherine Dock was apparently a failure because it was too small, while in many places the walking route disappears to allow boats to get as close to their depositories as possible. So much seems to have changed in the 1960s and 1970s which throughout the walk we hear was the time much of the dockland area fell into disrepair before it was reinvigorated as a residential and financial district much later – and even now it’s hard to picture the bustling and vital place it must once have been. The Thames has also been a source of considerable artistic inspiration with Jacobs Island being the place that Dickens set the world of Bill Sykes and his dramatic chase through the slums of South London. Similarly two buildings nearby housed artists Turner and Whistler who, while facing the north bank, produced some of their paintings while close to London’s main artery. A more obviously industrial influence is pointed out by Peter at the hydraulic works which he informs us was necessary for opening locks and bridges, as well as operating the safety curtains in the theatres of the West End. Of course the river had a huge influence on the businesses that grew up around it, so you pass an area full of former workshops where crews could buy rope, sails and other shipping material, including Ropemaker’s Field, a park whose metal pillars have a rope pattern carved into them. Pubs too are major landmarks with many dating back to the sixteenth and seventeenth century, claiming to be the place of execution for pirates like Captain Kidd. One notable pub near the end of the tour is The Grapes owned by Sir Ian McKellen which is over 500 years old and close to the place the transport ships for Australia set sail. City Hall to Canary Wharf is one of the medium length walks which will give you a sense of achievement as your reach the end, but has filled your head with fascinating insights into a less well-known area of the city. 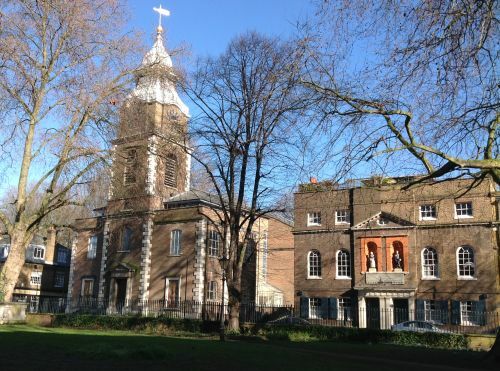 Walk London is designed to introduce you to new places, and this tour does exactly that – an interesting and engaging amble through a deserted, historic and beautiful part of town, that was once the lifeblood of the capital. By contrast, Mayfair and Soho are considerably busier areas and were the focus of the tube walk from Victoria to Oxford Circus. These tours have become a bit of a feature of the Walk London programme, which began with an anniversary walk for the Piccadilly Line last year and one for the Bakerloo Line in the spring (also guided by Mark). The Victoria Line, however, is one of the newest, opened we’re informed by the Queen in 1969 when she took the new line one stop from Victoria Station to Green Park, cutting right though the centre of London and now diagonally connecting Walthamstow with Brixton. But Victoria was not the only name proffered for this line, as guide and tube walk expert Mark informs us, Viking was on alternative option as was Walvic. Like the Bakerloo line which takes its name from a contraction of Baker Street and Waterloo, the Viking line would have spliced Victoria and King’s Cross together, while Walvic, unites Walthamstow and Victoria. And while we’re now more used to seeing this this type of word play used to create tag names for celebrity couples, clearly it’s far from new. From the train station, this walk takes you past Buckingham Palace where several food based anecdotes are on offer including Prince Philip complaining about cold food because the kitchens are so far away, and a visiting dignitary offering a prayer in his native language which was actually an instruction for his former-servant wife on how to tackle the extensive cutlery. Next to Green Park and some tales about double agents staying at the Ritz while Mark displayed his extensive knowledge of city trivia with tales about recent Bond novels being delivered around the world, the drinking habits of Michael Caine’s restaurant partner and how Michael Portillo escaped the paparazzi by running through Browns hotel. There is a little overlap with the Piccadilly Line walk, so you can hear again about Paul McCartney whistling in Burlington Arcade, but in the backstreets of Mayfair you learn about the Beatles impromptu rooftop gig one lunchtime, in what was once Apple Music in Savile Row, shut down by the police after 42 minutes due to noise complaints, or the likely apocryphal tale of Alexander McQueen sewing a rude message into the Prince of Wales’s suit. The final leg of the tour takes you past St George’s Church near Hanover Square where American President Theodore Roosevelt was married and finally on to Liberty’s close to where Michael Caine spent a night in the cells and we learn the Queen has curtain weights sewn into her hems to prevent any embarrassment from unexpected gusts of wind. One of the joys of Walk London is you never know what you’re going to find out, and by picking two completely contrasting guided tours, you end up with a huge sweep of history and insights into topics as wide ranging as engineering, spying and pop culture. Thankfully this year’s Autumn Ambles were a couple of weeks earlier so they don’t clash with the Film Festival, and the guides, as ever, are not just knowledgeable and able to field a huge range of questions, but friendly and engaging, making the experience more than just a sightseeing mission. The next Walk London weekend will be in January and I’m already beginning to wonder what I’ll find out about this infinitely amazing city.